Part 1 includes WFF Masters Men Over 35 yrs, WFF Mr Athletic Class 4 & 2 Combined, WFF Mr Athletic Class 1, WFF Overall, Luke Wood Tribute and Saltwater Classic Elite – Men. The best male and female bodybuilders and fitness athletes from throughout Australia competed at the Nationals in Darwin, NT, on October 16th for the NABBA and WFF titles of Australian Champions for 2011. The event also included the Elite Champions Saltwater Classic and Northern Territory titles. The winning competitors then went on to compete overseas – either at the WFF Worlds, or the NABBA Universe in UK. This massive widescreen 16:9 presentation brings you the COMPLETE MEN’S EVENT including all the comparisons and posing through to the special awards and Overall Posedowns. The big winner on the night was ABRAHAM ELZAIBAK taking out the NABBA Overall Australia and the Elite titles. 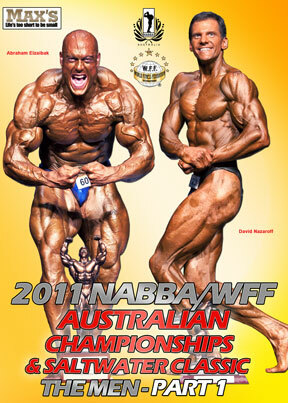 The very worthy Overall Australian WFF Men’s champion was David Nazaroff from WA.